Some of us enjoy the tactile feel of pen on paper. But after we have indulged, we are left with lifeless and easy-to-lose ink on paper. Can’t edit it. Can’t copy it to Word to expand on it. Can’t set a reminder for later. 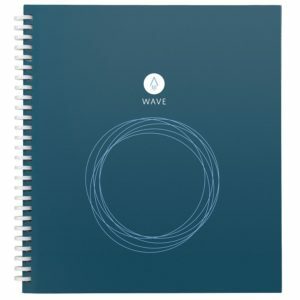 The Rocketbook Wave is a paper notebook that lets your write with an actual pen – not a stylus on screen. But it sends your notes to the cloud, using your own smart phone. Symbols at the bottom of each page allow you to send notes to specific cloud locations. If you write on it with Pilot FriXion pens (included), you can erase the notes and get a clean notebook by putting it in the microwave. Want to try it? I got you 10 percent off of Touch of Modern’s already-on-sale price of $19.99. Use this link.